The key to a successful construction project is to establish a balance between the program, the budget, and the schedule. Establishing a clear, well-communicated program of client needs and budget considerations is a fundamental part of this process. It is important for the client to be open and honest about their budget because it is one of the most important components in planning the project. Once a program has been established, we will use this as our “guide” to begin the design process. We will perform a site analysis of your property. By using this sensitive data, the site will begin to dictate & design the building by determining both its shape and orientation. The design is then presented to the client for discussion. We have the ability to prepare renderings and other visual aids to facilitate your marketing needs. Creating renderings of “works in progress” is a great way to market your product prior to having a building completed. Depending on the project, 3D software is used to assist us during the design development process. This enables both us and our clients to visualize the design in a “life-like” environment. Once the Design Development package has been completed, the Construction Document phase begins. This involves defining all elements of the project usually with the assistance of autocad. Dimensions, details, and specifications are all defiining elements that go into these documents. Just as the contract for construction between the Owner and Contractor is a binding and legal document, so are the construction documents. It is critical to have a detailed set of drawings defining the scope of the project to protect the owner and his/her investment. Construction Administration is a very important phase of the project. One of the first tasks faced in this phase is the selection of a Contractor. Whether through bidding or negotiation, we are here to assist you with this process. Helping you with selecting a contractor can be very beneficial especially if you have no prior construction experience. Once construction begins, we will follow the project through the entire construction phase. Our services include site visits, reviewing pay requests, reviewing shop drawings submittals and change orders to name a few, as well as resolving many issues that surface during this phase. Master Planning is not just placing buildings on a site, but to create a sense of place and community. The characteristics of the site should help dictate the layout of its components. The exterior relationships between buildings are just as important as the relationship between interior spaces of buildings. 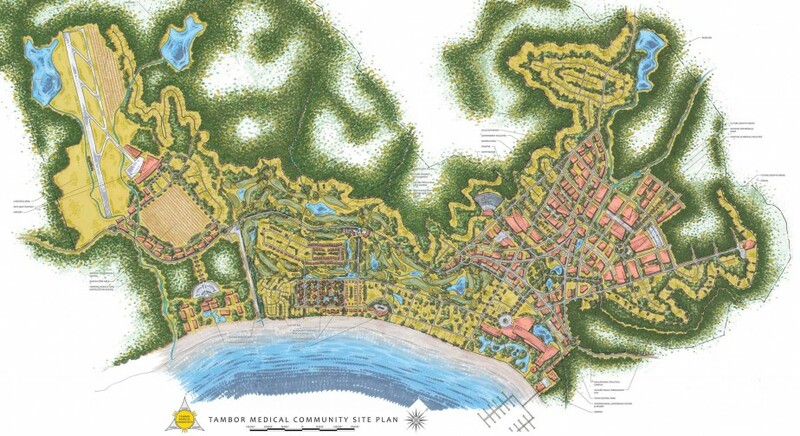 Shown below is a 4,000 acre medical community with Educational, Arts, Retail, Hospitality, and Residential components. The Landscape Plan: Once we have a defined design for the building, you will begin working with our landscape architect to develop a site specific design. Not only is it important to make sure the design concept is fluid for both the building shell and the interior, but it must also be applied to the landscape and exterior environment to achieve a wholistic design.